Houten, "Cycling city 2008" in the Netherlands, celebrated the official opening of two railway stations, a work of art and -by opening a giant bicycle wheel lock- the grand bicycle parking facility under the main railway station, with a town wide party on Saturday 16th April 2011. The bicycle parking facility for over 3,000 bicycles is located directly under the railway tracks and platforms. The bicycles are not hidden in some dark cellar in a distant corner here. No, this bicycle parking facility is in fact an important and integrated part of the station. The bicycles are sheltered and guarded for free. There are the logical extra services like maintenance, repair and rental bikes. But there are also lockers and toilets and even the Tourist Office is located in the same building as well. The lightness and the bright colours are not just making the facility pretty, coupled with the fact that all passengers walk right through it and there is someone present at all time, it creates a high level of social safety. Which is an important factor for a facility to be used at all. This bike parking facility is called 'transferium' because it is so easy to transfer from one mode of transport to the next. In this case from bicycle to train and vice versa. In fact 60% of train travellers in Houten come or go by bicycle. In the rest of the Netherlands that number is around 40%. The bicycle parking facility opens daily just before the first train leaves in the early morning and closes only after the last train arrives in the late night. Which on weekdays is from 5 am to 1:15 am. Houten is a relatively new town. 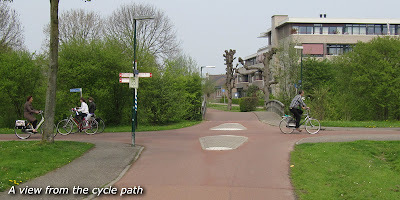 Originally a small village that (from the 1960s on) was planned to be expanded dramatically to give the people from nearby city Utrecht a better place to live. In the early 1980s the first homes were ready and in 1982 a new railway station replaced the old one that had closed in 1934, to cater the developing larger town. In the 1970s the town had a population of 4,000. Today Houten proper houses 44,000 people and it will grow even more. creating multi-level crossings where the cycle routes and motorised traffic cross. This resulted in the world famous very cycling friendly town where the model split was 44% of all trips by bicycle versus 31% by car the last time it was measured (2002). 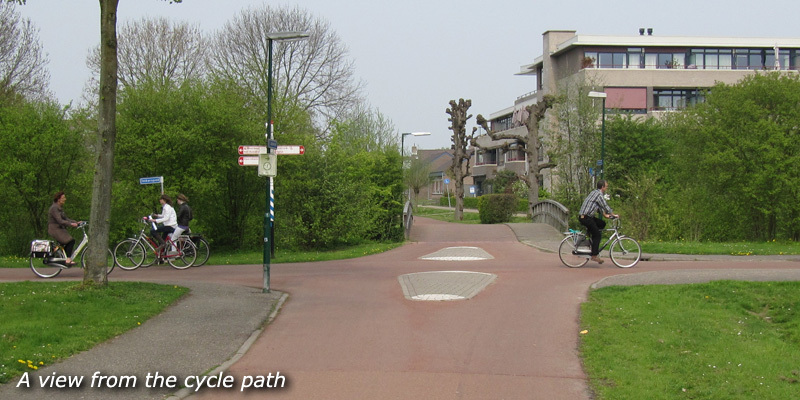 Houten has set the standard for the way many towns and cities now treat cyclists. Houten was built on either side of the most important North-South railway line of the Netherlands. This line had to be expanded. 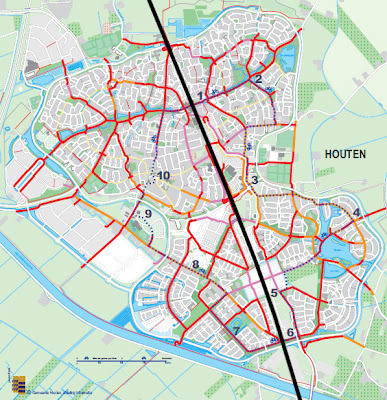 The railways run for 5.3 kilometres (3.3 miles) through Houten and from 2007 on the tracks were doubled from 2 to 4 tracks. In collaboration with the Dutch Railways the council of Houten took this opportunity to create an entirely new main railway station and they also updated the town’s centre. For the new most southern neighbourhoods in Houten a completely new second railway station was created. The original 1868 railway station building was picked up and moved to a new location 150 meters (492ft) South, to make way for the extra tracks. The North-South railway line (black) cuts Houten in half. The budget for this railway project was 110 million euros to which Houten contributed 30 million. Now that there are two tracks in each direction the local trains and express trains do not interfere with one another anymore. The new railway tracks were built 1.8 meters (5.9ft) higher than the old, so that the space under the tracks could be used in a better way. It made underpasses easier and lighter and thus more attractive. The extra space under the main railway station is now the location of the beautiful new bicycle parking ‘transferium’ with over 3,000 parking spaces. At the second railway station another facility will be built for 1,700 bicycles. High numbers for a town of 44,000 people. But simply necessary when cycling is the most important mode of transport. David has written more posts about Houten before. Wow... I'm lost for words. All this (and the cycleways to go with it) for a small town, while BoJo blathers on about his BorisBikes and his cycling crap-superhighways. I know which are more useful, and it isn't anything to do with BoJo. I love your style of writing. You present a topic to your readers and then break it down, providing statistics and information that makes for a most enjoyable read. But then after I read your posts, I want to break down and cry from bike infrastructure envy! Isn't the cycle path for cyclists? State of the Art Bikeway Design, or is it?